SILVERSPRING, Maryland -- NOAA's Fisheries Service today launched a voluntary program to encourage commercial and recreational fishermen to safely release Atlantic shortfin mako sharks alive and report the releases to NOAA for posting on an online map. "We are working with the fishing community to encourage fishermen to voluntarily release these sharks alive to help sustain the shortfin mako population," said Eric Schwaab, assistant NOAA administrator for NOAA's Fisheries Service. "By releasing sharks that are unintentionally caught or caught for sport, U.S. fishermen will be leaders in encouraging fishermen from other nations to conserve this shark species." Shortfin makos are often caught unintentionally by commercial fishermen who are targeting swordfish and tuna with longline gear. They are also caught by recreational fishermen and are a popular catch in shark tournaments. An increasing number of these tournaments encourage the live release of sharks to promote conservation. It is legal for commercial and recreational fishermen to retain the sharks. However, recreationally caught sharks must not be smaller than 54 inches from the tip of the shark's nose to the fork of its tail. While some fishermen continue to retain shortfin makos for food, fins, and jaws, NOAA's Fisheries Service encourages fishermen to consider the effect on the stock in the long-term and choose to release them. "I plan on making this a part of my daily routine if we catch and release any shortfin makos," said Sampson, who operates the charter vessel, Fish Finder, from Ocean City, Md. "I'll encourage fishermen who may not want to take home the shark they catch for food to consider releasing it." NOAA encourages fishermen to learn how to safely release sharks so that they are not injured and the sharks are released in good condition. 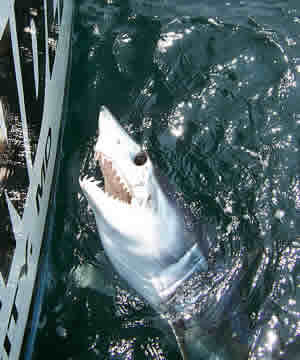 Fishermen may obtain a brochure at http://www.nmfs.noaa.gov/sfa/hms/Compliance_Guide/index.htm on the safe release of sharks and other highly migratory species.